Captain America is ready to protect your automobile's carpeting! 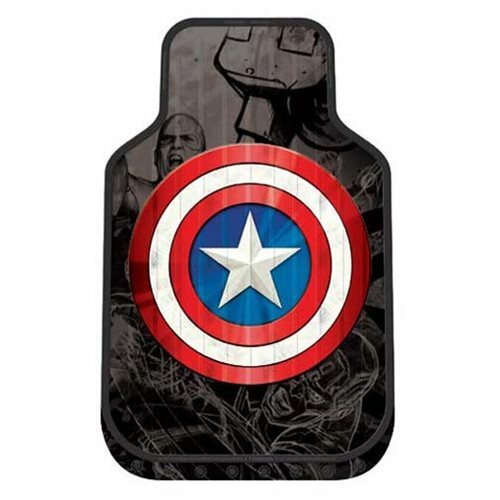 This Captain America Shield Plasticlear Floor Mat 2-Pack features a cool gray and black background of Cap in battle, along with Cap's shield in full-color in the foreground. These floor mats are universal fit and ultra-durable. Sold as a pair, they measure about 25 1/4-inches long x 16 1/2-inches wide. Molded in vibrant colors, from the highest quality materials for long-lasting wear, will not fade and these are easily cleaned with soap and water. Includes 2 mats. Made in the USA. Ages 13 and up.